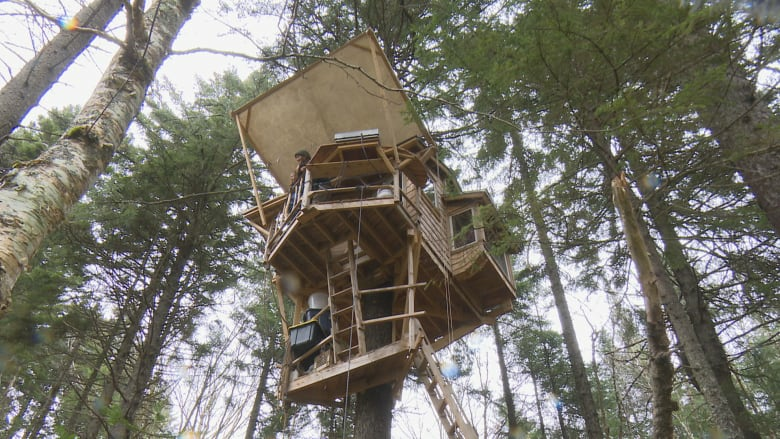 Far from Wi-Fi or any drivable road and more than six metres up a red spruce tree is Alex Thomas's livable tree house, complete with a kitchen, solar panels and a wood stove. The exact location of Alex Thomas's tree house is a well-kept secret — and he plans to keep it that way. A 30-minute walk in the Acadian forest, far from the nearest logging road, Thomas drinks tea and looks from the deck at a small brook below. It's quiet, peaceful and more than six metres up an old red spruce tree. "This tree in particular jumped out because it's in such a pretty spot." Thomas, who built this home on property owned by his family, said he's been interested in tree houses since he was a kid. "It's something that had been in my imagination for a long time," he said. So last fall, the 26-year-old had some spare time and got to work. It's a steep climb up two ladders to get to the deck, which features an outdoor gas range and a sink. Thomas uses water he hauls up from the brook below. There's a filtering system for drinking water. Inside the tree house, it's warm, and comfortable. Thomas insulated the walls but keeps a small wood stove going once the temperature starts to drop. "You have to keep the wood stove kicking all the time or else it gets pretty cold." A bench lines the wall, which pulls out into a bed. There's a small table, a bookshelf and dozens of cassette tapes. Thomas says that as long as he keeps the wood stove fired up, the tree house stays warm. The walls are thin but also insulated. Thomas chose a Sarah Harmer tape that he slaps into the Walkman. The song, Don't Get Your Back Up, played on the speaker as he gave a demonstration of his lights, also courtesy of the solar panels. But this far into the forest, you can't have everything. "I don't have refrigeration, that's the big thing," he said. "It limits what you can cook." Undertaking this kind of construction is not for the faint of heart. Thomas said it was a labour of love and at times a group effort. "I had a couple of big work parties for the heavy lifting when we lifted the walls up," he said. Most of the construction was done up in the tree, with the help of harnesses and pulleys. "It's a pretty technical build, building this in the ground would be a lot easier. And possibly building it closer to a road would have also helped. "Getting stuff out here is the other big challenge." "We're quite a ways from any drivable road so there is a lot of wheelbarrow action building this treehouse." While Thomas said he finds the solitude relaxing, he doesn't retreat into the woods for days at a time. A day job in construction and a social life keep him going back and forth to Sackville most days. "I'm no hermit, I like hanging out with people, but I do like my space, and out here it's really easy to get space. "Without having reception, it's hard to stay off my phone otherwise, it's not hard to stay off my phone out here." Between the walk to the road, then the drive into town, he estimated a 35- minute commute, but that will change when snow starts to fall. "The … industry roads that you get on are not plowed, so in the winter time, rather than being a 30-minute walk, it's an hour ski." Thomas plans to stay closer to civilization during the winter and only spend a few nights a week inside the tree house. "I can live here whenever and it's a comfy place to hang out." Tori Weldon is a reporter based in Moncton. She's been working for the CBC since 2008.